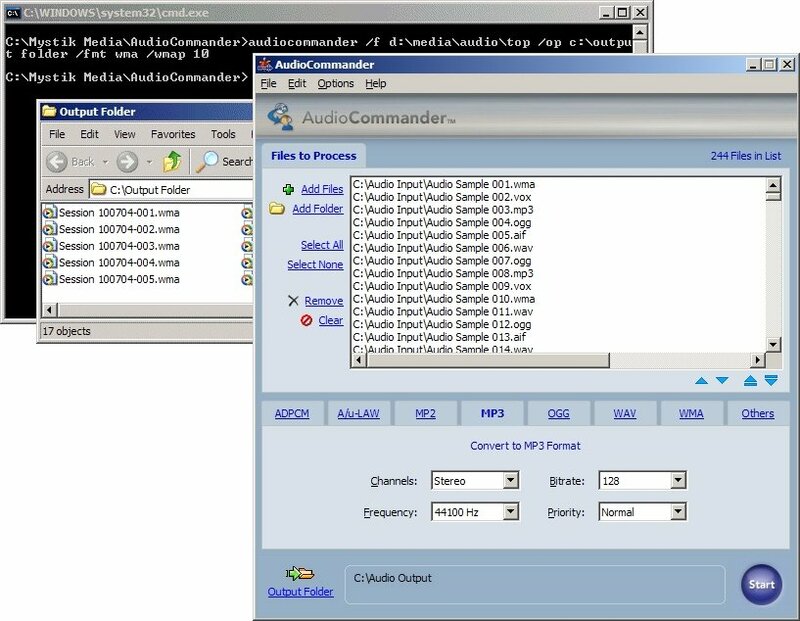 AudioCommander Convert 20+ audio formats with powerful command-line or easy-to-use interface. O in short: Powerful batch conversion for CD WAV MP3 WMA OGG MP2 AIFF AAC AC3 AMR 3GP AU VOX RAW PCM GSM ADPCM A-LAW u-LAW g72x DSP MPC MP+ MOV AVI audio and more with highly configurable command-line support or easy-to-use interface. Powerful, fast, and highly configurable solution for both interface and command-line conversion of nearly all conceivable audio formats. Settings are provided for bitrate, frequency, channels, and more. Convert from CD, MP3, WAV, WMA, OGG, AAC, AC3, AIFF, AU, VOX, RAW, PCM, ADPCM, A-LAW, u-LAW, MP2, FLAC, ALAC, AMR, M4A, MP4, WavPack, etc. to MP3, WMA, WAV, OGG, AAC, ADPCM, AIFF, AMR, A-LAW, u-LAW, and VOX with ease. AudioCommander can also be used to change the compression for supported formats. The comprehensive range of supported formats makes the software very flexible, and provides a complete solution for conversion of most any audio file desired. Conversions are performed directly from format to format, which increases conversion speed and eliminates potential quality loss. The ability to automatically transfer audio tags from the source format to conversion output is also present. AudioCommander offers an extensive array of interface settings and command-line switches for complete control over how the software functions. The software is fully functional and can be controlled entirely via command-line operation. Conversions can be performed on an entire folder of files simply by passing the folder name to the /f switch for command-line support or using the Add Folder interface command. For command-line, wildcards and comma delimited filenames are also supported. Even multiple paths can be separated by a comma, or any combination of filename(s), paths, and wildcards. Furthermore, when converting a path, you can specify a switch or interface option for all subfolders to also be included. Additional built-in options include: error logging, the ability to automatically use the source file's path for conversion output, overwrite protection (append unique numeric value to the base filename for existing files), deletion of source file(s) after successful conversion, FreeDB support when ripping from CD, and much more! See above information and user's reviews about AudioCommander Convert 20+ audio formats with powerful command-line or easy-to-use interface.